Based on a simple gambling cafe theme, Cafe Casino has been running since first opening their doors to players in April of 2016. They are associated with a number of other popular sister sites, and they are backed by a company with a good reputation for giving players a solid experience. This mobile casino has been provided a license to operate in Kahnawake, a very solid jurisdiction that has given players plenty of reasons to have faith in them as well, and they accept players from the United States as well. Mobile casino players who want to get started here should use the CAFE10 promo code before making any deposits or real money wagers. If you do, then you’ll get a $10 free chip added to your account that give you a chance to try out any of the games that you want. There’s a 60x wagering requirement with a $125 maximum cash out value, and the bonus itself is not cashable, but it’s a cool way to have a chance to run up real money winnings on the go without having to risk anything of your own. It also gives you a chance to try out the app to see how it works on your smartphone or tablet without having to deposit money and risk it not being a good fit. Aside from the free $10 offer, players get two options for a welcome bonus on their initial deposit. You basically get to choose between a larger bonus or more favorable terms and conditions. With CAFE500, you’ll get 500 percent worth up to $5,000, but the wagering requirement is 35x with a 10x maximum cash out based on the size of your deposit. On the other hand, you have CAFE100, which gives you 100 percent worth a maximum of $1,000, though the play-through is lower at 25x with no max cash out. Both of these bonuses are completely cashable and allow you to play most games. In addition, Cafe Casino offers several unique welcome bonuses to Bitcoin users. There is the Super Play Bitcoin Bonus that offers a 600% match bonus up to $6000 on your first Bitcoin deposit. This deposit is subject to a 35x playthrough wagering requirement and has a max cashout of 10x the value of the deposit. The other Bitcoin bonus offers a 150% match bonus up to $1500 on your first Bitcoin deposit, with a 25x wagering requirement and no max cashout value. One gives a larger deposit match but the other has more favorable terms. 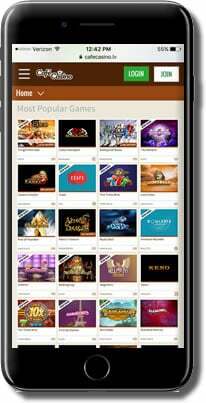 There are three software companies that have contributed content to the Cafe Mobile Casino, and this gives players a wider range of games with various styles of presentation and gameplay. It’s worth noting that both Rival Gaming, Realtime Gaming and Betsoft, the companies that have content here, are regularly audited by respected independent firms. This gives players an added level of peace of mind since it’s something that can’t really be faked. The bottom line is that the software here is on a pretty high level, and this is perfect for mobile players who care a lot about the overall quality of their experience. Because there are games from two different software developers here, the mobile interface has been created in a way that combines both sets of titles in one smooth, intuitive and easy-to-use environment. 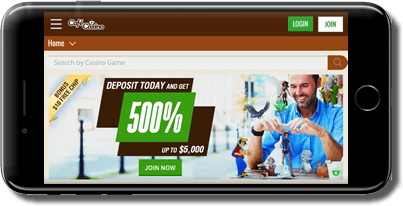 The lobby is the core of the mobile interface here, and it makes it really easy to find the mobile casino games you’re looking for in just a couple of moments, even though there are many to choose from. Cafe Mobile Casino has a particularly flexible interface that puts players in the drivers seat no matter what kind of smartphone or tablet they have. Windows Mobile and Blackberry devices are compatible with this mobile app along with those that use Android, iOS and other operating systems. The only real requirements are that you have an Internet connection and a web browser that supports Flash, which includes virtually every mobile device with a touch screen made in the past several years. Players at this mobile casino will not get the full game selection compared to if they played in the full version on a computer because not all of the games from Rival and Realtime Gaming have been converted over to the mobile format. With that having been said, there are still dozens of titles to choose from, including a lot of slots. This is what most people are interested in since they are the most popular type of game in mobile casinos today. These slots cover a wide range of themes. You’ll find low-volatility, high-volatility and plenty of progressive slots in both the five-reel video format and the three-reel classic format. One concern that some players have about playing mobile slots is that the controls can be jumbled together if they’re not scaled properly, but that’s not a concern here. In fact, all of the games have had their controls modified to work perfectly with any device, including smartphones with a smaller screen. Even though slots are more popular, there is still a good selection of table games here. As we noted above, not all games are available, and the most notable case of this is probably craps. However, all of the other classic casino titles can be found at the Cafe Mobile Casino, and this includes roulette, Baccarat and multiple forms of blackjack. Video poker and scratch cards also give players a chance to get in on the action without having to commit a very serious chunk of time since the game rounds go by quickly, which is perfect for the mobile interface. Cafe Mobile Casino offer two ways to get in touch with the customer service team that work well on any smartphone or tablet. The first option is to simply call them, an option that is available at any time, any day of the year. The other option is to use an email form from their interface, and you’ll get an email back within a couple of hours in most cases. The former option is best for issues that need an immediate resolution, and the latter is best for situations that can wait. This mobile app allows you to make deposits and withdrawals straight from your mobile device as well with a very intuitive and easy-to-use cashier section. Bitcoin, credit cards and direct bank transfers are the main options available here, and they have a great tutorial system to help you get set up with bitcoin if you want to start using that as well. The game selection, promotions and support are all excellent for the Cafe Mobile Casino app. They have done a great job in providing a very well-rounded opportunity for players, and with a free $10 just for signing up, it’s hard to find an excuse not to try playing here. Overall, we believe that this site has a lot to offer a lot of different types of players at all different stakes. We did notice that there is no live chat feature for contacting customer support, but mobile users might not really care about this. we would also like to see a few more US friendly deposit methods available, but we realize that this is a tall order.